Remember when you were a kid and you used to lick the batter from the bowl when your mom was baking something? That was sooo good! 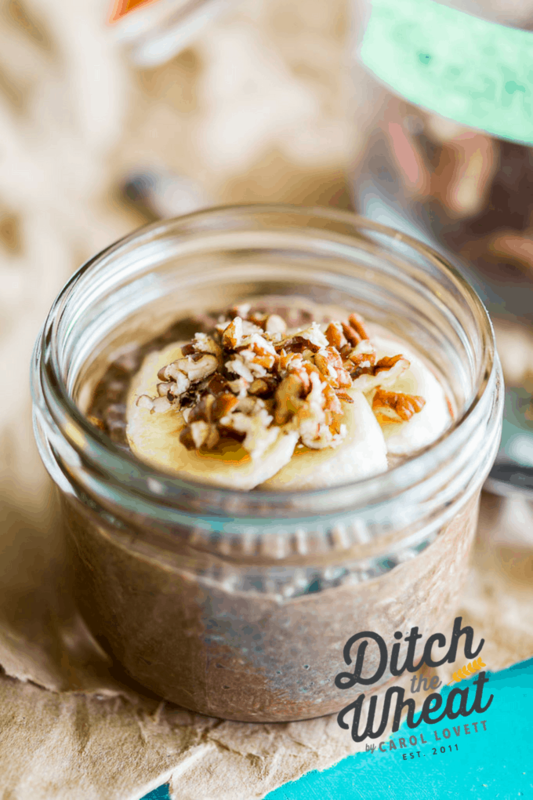 I still lick the batter from the bowl 😛 This Brownie Batter Chia Seed Pudding reminds me sooo much of brownie batter! It’s so easy to make too! It always amazes me how just a few tablespoons of chia seeds thicken up and turn into pudding. 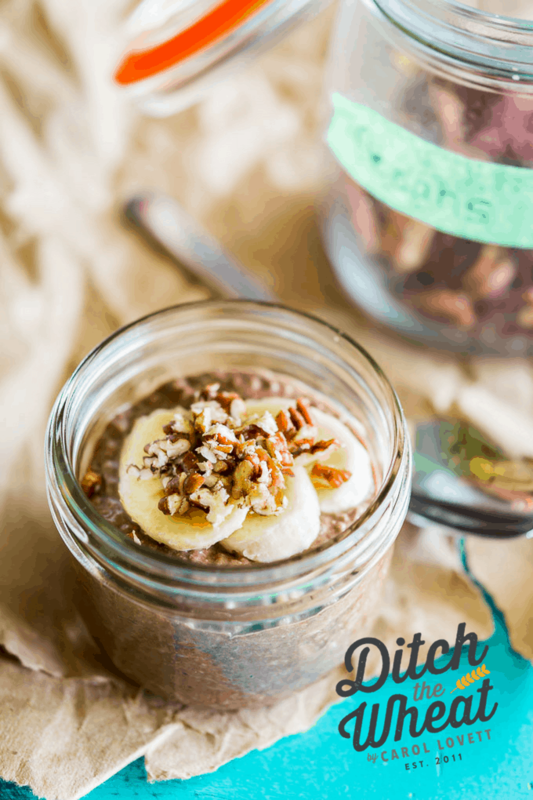 I hope you enjoy this easy Paleo snack or Paleo dessert (whatever you classify it as). 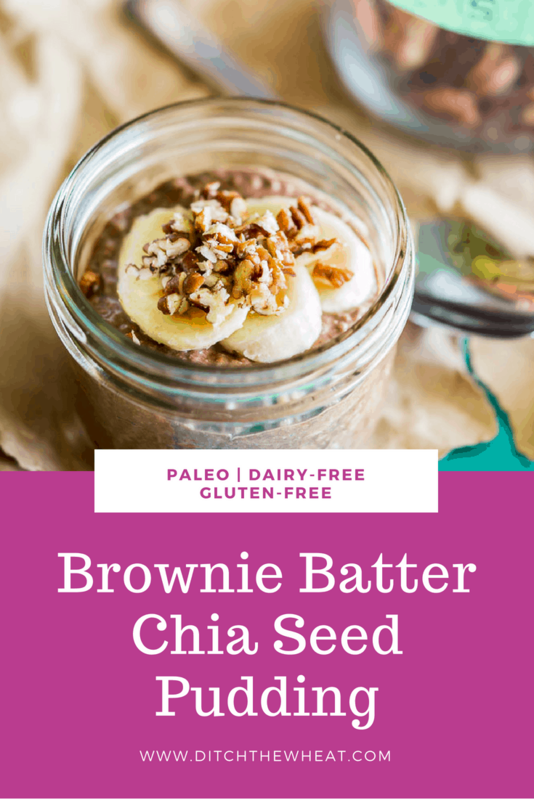 If you want more snack ideas make sure to check out my ebook, The Grain-Free Snacker or for easy Paleo desserts checkout Indulge. My print cookbook Ditch the Wheat has a whole chapter devoted to Paleo snacks 😀 😀 😀 Can you tell I have a sweet tooth! In a small bowl, gently whisk the coconut milk, cocoa powder, raw honey, lemon juice, and salt until just blended. Whisk in the chia seeds; let stand 5 minutes. Stir to distribute the seeds if they have settled. Cover and refrigerate for at least 2 hours before eating. Spoon the pudding into 1 serving bowl or glass and serve. Top with desired toppings. I used banana slices and chopped pecans.